Irregular coating, multiple layers and smooth sanding when cured will intensify the used effect. Apply thin coats to white, or light colored substrates to. Apply to Black and white photos for an authentic vintage touch. Turn can upside down and remove nozzle, allowing safety ring to fall out. Shake well for 2-3 minutes. Protect object and surrounds from spray mist during application. Apply at a minimum distance of 20cm from substrate. Works on many substrates such as paper, cardboard, canvas, wood, metal, ceramic and synthetic surfaces. Check compatibility on a non visible part of your object. The can is equipped with a Flat Jet Medium cap that can adjust for horizontal or vertical spray output. Dust dry after 5 minutes, touch dry after 30 minutes and cured after 24 hours subject to surface, temperature, humidity and thickness of layers. Can be combined with Montana GOLD Spray paint, Montana ACRYLIC markers and ink, as well as traditional acrylic paints. For additional protection and sealing, apply Montana Varnish once fully cured. 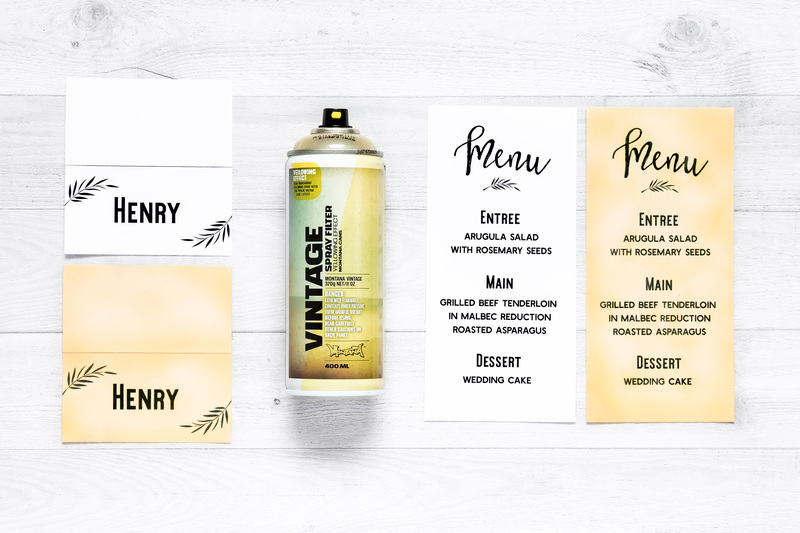 The Montana VINTAGE SPRAY FILTER – perfect for realistic used-look and Vintage effects!